There was a time when we'd hop the train and schlep to Lakemba for a plate of Jasmin's falafels. But now they've opened a branch in Leichhardt, it's a mere schlep. 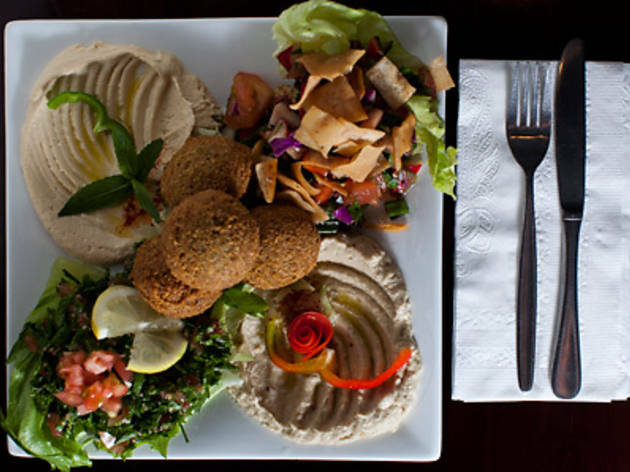 Falafels ($7) are crisp pucks of spiced chickpea and coriander. A dish of smooth hummus topped with minced beef and parsley ($12) is fine, but salad of crisp-fried flatbread, tomato, cucumber and parsley freshens things up. And, of course, there's the outstanding baba ganoush ($7) – incredibly smoky eggplant dip that's perfect with slices of spiced grilled lamb ($12). Be sure to try the little missiles of spiced sausage ($12), filled with pine nuts and laced with chilli. 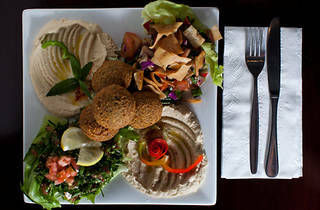 Head back during the day and order a Lebanese-style sandwich ($5-$7) from the more casual diner-style space next door. In an area that does most of its trade in red sauce and red wine, it's not all that surprising the restaurant is fairly empty at 8pm on a Saturday night. Or perhaps it's the atmosphere: there isn't any. It's an incredibly bright room with nought but a waiter's station as decoration. It doesn't really make for an amazing place to eat your dinner but you can always take away and, if you live close by, they deliver.